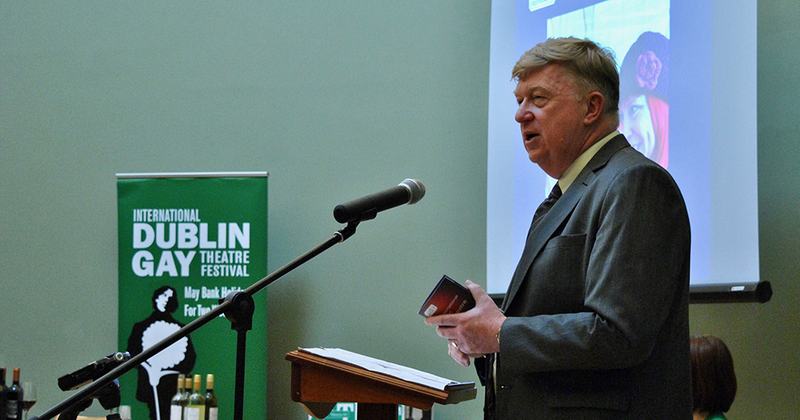 Last night saw the launch of the 16th Annual International Dublin Gay Theatre Festival. News 17 April, 2019 . Written by Katie Donohoe. The 16th International Dublin Gay Theatre Festival, Ireland’s most exciting and diverse theatre festival returns to the capital from May 6 to 19, kicking off the summer season with 21 world-class performances from the four corners of the world, across 5 Stages for two glorious weeks this May. The festival, the largest LGBT+ theatre festival in the world was launched last night (April 16) in City Assembly House by the Minister for Culture, Heritage and the Gaeltacht Josepha Madigan. This year’s festival brings critically acclaimed productions from the UK, USA, Canada, Ecuador, South Africa and Australia, as well as the home-grown talent to Dublin’s stages for this jam-packed two-week-long event. The International Dublin Gay Theatre Festival, which is in its 16th year has gone from strength to strength, drawing audiences and performers from all over the world to Dublin annually, even weathering the financial cutbacks and darkest days of the financial crisis. “I am very grateful for the Minister’s presence today and that of our first supporter and patron Senator David Norris and longtime supporter Senator Jerry Buttimer and other Oireachtas colleagues. To live in a society where diversity is embraced and encouraged is a privilege many of our LGBT+ artists abroad do not enjoy. To identify that need and to place Dublin at the centre of welcoming diverse artists and writers has, in the absence of sustainable resources, been the key to the longevity and relevance of the International Dublin Gay Theatre Festival since 2004. “Artists at home identify this Festival as being one open to new voices. We are. Artists abroad make huge sacrifices to tell their stories here. Our audiences understand the art form and are open to theatre holding a truthful mirror up to society as we know and live it today. The topics are historic and contemporary. They are shared by other sections of society and all are welcome at our festival. “The Me Too experience not only impacts on women but on gay actors too, drug abuse and chemsex is a reality of life today. Parenting, masculinity, relationships and how to hold onto them, changing times in the Gardai and in seminaries all feature in our theatrical discussion. The still almost silence on the age of AIDS and modern HIV diagnosis is challenged as is the experience of secrets in the past. The hidden lives of heroic Irish women are among the dark and very funny characters you will encounter. There are stories of criminalisation, love, growing up in Ireland or the Deep South, from talented and award-winning artists waiting to take to our small stages. “As the population gets older, a population that wasn’t allowed marry weren’t allowed children, weren’t allowed to have pension rights that it’s really important that we share with younger people what people went through and what they survived. 17 April, 2019 . Written by Katie Donohoe.